This year the Qt World Summit is back in Europe. It will be held October 11th and 12th in Berlin. basysKom is proud to sponsor and to participate in a number of ways. At the exhibition we will showcase a distributed industrial automation scenario based on Qt Quick and QOpcUa. QOpcUa is an upcoming Qt module basysKom initiated, aiming for simple integration between industrial controllers and HMIs. The showcase also features integration of telemetry data into a Microsoft Azure-based Cloud-Application via MQTT. To highlight the cross platform capabilities of Qt, the HMI is deployed to a number of different devices. At the conference we will present our Qt Lite experience. “Practical Qt Lite” will be held Wednesday at 15:00, Room A03. Come visit us if you are interested in having smaller Qt builds for your embedded project. 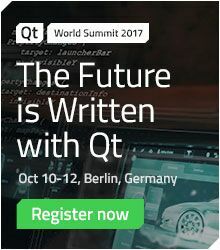 This year, the Qt Contributor Summit is co-located with the World Summit. Contributors to Qt discuss the development and directions of the Qt project. The Contributor summit happens Monday and Tuesday, right before the World Summit. basysKom will offer a session on QOpcUa on Tuesday at 15:00 in Room2. If your are interested in OPC-UA and its integration into Qt please join the session!